Introducing the NEW Kluson® locking tuning machine with 19:1 gear ratio for right-handed instruments. 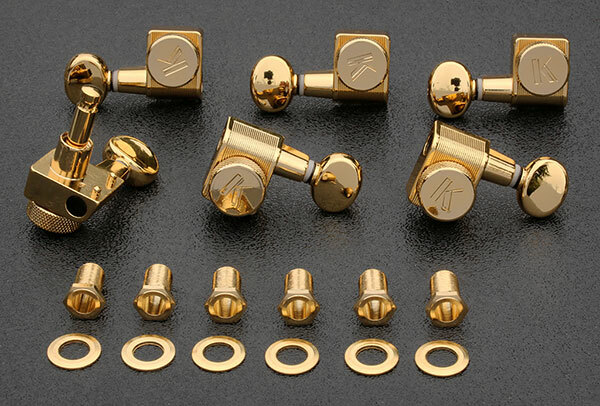 These state of the art tuners are designed for usage on contemporary Fender® American Standard® and Standard series instruments that utilize the 2 discreet location pins instead of mounting screws. Kluson® has incorporated the user-friendly locking system that is located on the back of the tuner housing utilizing a knob for simple twist-to-lock or release. This drop-in, no modification required design is an upgrade to your factory tuning machines in appearance, gear ratio and design. Uses the common modern 25/64" (10mm) peg hole with a hex head type screw-in bushing and no mounting screws! All mounting hardware is included as shown.